Inagamov S.Y., Mukhamedov G.I., Abzalov A.A. The purpose of the given work is research of structure and diaphragm properties of polycomplexes; received by interaction sodium carbon methyl cellulose (Na-CMC) with urea-formaldehyde oligomers (UFО) a various structure. Ultrafiltrational, water bulking up properties and structure of polycomplex membranes on the basis of Na-CMC and UFО are studied. It is shown, that at equimol a parity of co-operating components Na-CMC - UFОl (linearly - the branched out structure) and UFОt (with triasin cycles) membranes have the least degree of swelling and water penetration, and a lot of one of components (Na-CMC or UFО) swelling and water penetration raises. At equimol a parity of components interaction between macromolecules the greatest which lead to formation of the maximum density of a grid the least degree swelling and water penetrations. Presence of free functional groups of this or that component at its surplus leads to increase swelling and water penetrations of polycomplex membranes. Using the given ultra filtrations and swelling, values of the sizes of a time of polycomplex membranes are calculated. It is established, that with change of a parity of co-operating components it is possible to regulate properties and the sizes of a time of polycomplex membranes received on the basis of Na-CMC with UFО a various structure. Key words: polycomplex, membrane, swelling, water penetration, the sizes of a time, structure. Polycomplexes (PC) are products of interaction of two polyelectrolytes which find all wide application in quality flocculants and reagents at the decision of ecological problems , for creating the dividing membranes , biocompatible polymeric materials of medical appointment [3, 4], effective structure formation disperse systems, in particular soils and dirts  and as a basis for soft medicinal forms in pharmacy . Last years more and more wide application have received hydrophil bases as a basis for soft medicinal forms in pharmacy . Scope expansion hydrophilic bases in quality ointment bases instead of food fats and other scarce auxiliary substances speaks their ability to be dissolved in water or practically beyond all bounds to mix up with it. It gives the chance introductions in hydrophil bases of significant amounts of water solutions of medicinal substances, providing their high resorption from ointments [6,7]. The purpose of the given work is research of structure and diaphragm properties of PC received by interaction sodium carboxymethylcellulose (Na-CMC) with urea formaldehyde oligomers (UFО). Experimental. In work used cleared Na-CMC - a product of the Namangan chemical plant with degree of replacement 70 and degree of polymerisation 450. The second a polycomplex component concerns to nitrogen inclusive to polymers. In work used UFО with linear and cyclochain structures. Polycomplexes received mixture of two co-operating components in corresponding proportions and in certain technological conditions . The received polycomplex basis for soft medicinal forms has рН=6,0-7,6. m - weight of the bulked up sample. Elektronno-microscopic researches of surfaces and having chopped off (end faces) of films spent on a scanning electronic microscope "Hitachi - 520" (Japan) with resolution 60 Å examples received a method fragile having chopped off at temperature of liquid nitrogen . Results researches was fixed in electronic microphotos. secondly, vaseline is not soaked up and not washed off from a skin and linen. Therefore, is of interest, finding-out as influences exchange properties at drawing on a skin of the bases received by means of Na-CMC and UFО. It is necessary to notice, that the basis received by us, at drawing on a skin, in 7-10 minutes forms a thin membrane. Influence of a membrane on exchange properties of a skin can be defined studying of the sizes in it. For this purpose, experimentally defined water swelling and water penetration of films of the polycomplex bases received by means of Na-CMC and UFО. It is known , that water bulking up properties of the PC depends by nature, type of communications and a geometrical structure of co-operating components. In this connection we study one of the basic properties of the PC - ability to bulk up in water environments which essentially depends from rn - environments and parities of components. These researches represent the big interest for personal computer Na-CMC-MFO of various structure in connection with possibility of regulation of their geometrical structure and the nature of communications, not changing the chemical nature of initial components. and UFОt (with triasin cycles) samples have the least degree of swelling, and a lot of one of components (Na-CMC or UFО) swelling raises. It is possible to explain changes of degree of swelling of polycomplexes Na-CMC-UFО as follows. At equimol a parity of components interaction between macromolecules the greatest, i.e. between polycomplex components occurs full linkage Na-CMC with UFО, stabilised both hydrogen, and ionic communications which lead to formation of the maximum density of a grid (fig. 1). In this case the least degree of swelling of membranes Na-CMC and UFО (tab. 1) is observed. b - model of a polycomplex with superfluous maintenance UFО. Presence of free functional groups of this or that component at its surplus leads to increase swelling membranes. In case of superfluous maintenance Na-CMC in a membrane of the polycomplexes the increase in value of degree of swelling is connected with presence free carbocyl groups (fig. 2, model) . That fact is interesting, that UFО in itself do not bulk up, i.e. hydrophob, but their presence at superfluous quantity as a part of the polycomplexes leads to increase swelling. Apparently, it is connected with the superfluous maintenance hydrophilic functional groups UFO and with increase of osmotic pressure in capillary-porous structure of the polycomplexes (fig. 2, model). From table 1 it is visible, that the more triasin cycles in chain UFО, the it is more swelling than membranes of the polycomplexes for all parities Na-CMC and UFО. It means that bulking up ability of these samples in more to a measure are defined by ionic communications. As is known, polyelectrolyte the complexes stabilized by ionic communications, have the big degree swelling  in comparison with the polycomplexes stabilised by hydrogen communications on a basis polycarbonate of acids [10, 11]. Similar effects of change of degree swelling observed for polycomplexes Na-CMC-UFОl and Na-CMC-UFОt where with increase of quantity of interchain ionic communications increases swelling in 2-4 times. As it has been noted, with increase in cyclic fragments to chains UFО goes unregularizing polycomplexes structures that has been confirmed by a radiographic method . Thus, with density increase seams degree swelling both more mechanical durability and the module of elasticity of the polycomplex bases received by means of Na-CMC and UFО  decreases. Similar results were observed earlier in works [2,14]. d - a thickness of a membrane. Experimental data of dependence of factor of water penetration K from a parity of components of membranes of the polycomplexes and their composites received by means of Na-CMC and UFО various structure are presented in table 2. From table 2 it is visible, that the factor of water penetration with increase in maintenance UFО to equimol structure decreases, and further growth UFО leads to increase of factor of water penetration. As is known [2,14], water penetration of polycomplex membranes depends from hydrophil, density of packing of macromolecules and on number of intermolecular communications. The minimum value «K» at equimol structure Na-CMC and UFО is connected with formation of the greatest number of intermolecular hydrogen and ionic communications between reacting components which lead to frequency increase seams in the polycomplexes Increase of factor of permeability of membranes a lot of one or other component is caused loosen and formation of heterogeneous porous structure. The considerable contribution on value of factor of water penetration render hydrophil functional groups Na-CMC (-SOO-) and UFО (-NIT+, NH+2). Value of factor of water penetration K for membranes of polycomplexes Na-KMTS-MFO with the linearly-branched out structure above in comparison with membranes of the polycomplexes from 15 % triasin cycles in chain UFО. And in all variants of the polycomplexes equimol structure has the minimum value of factor of permeability that is connected with density increase seams. Data on calculation of the sizes of a time of membranes of polycomplexes and their composites are presented in table 3. 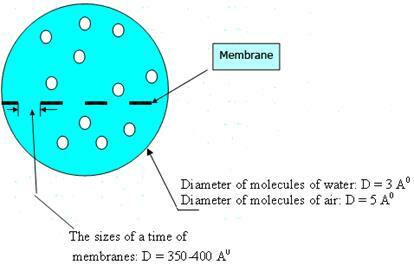 Results of experimental data show, that the sizes of a time of membranes (D=350-400 Å) in comparison with the sizes of molecules of water (Н2О; D=3 Å) and air molecules (О2, СО2; D=5 Å) differ in 90-100 times (fig. 3). Fig. 3. Comparison of the sizes of a time of membranes of polycomplexes with water and air molecules. Conslusion. Thus, at application of polycomplexes as a basis for similar ointment medical products, at their drawing on a skin form a thin membrane. With change of a parity of co-operating components it is possible to regulate properties and the sizes of a time of polycomplex membranes. The formed membrane on a skin surface, at drawing on a skin does not render any negative influences, i.e. completely keeps gas exchange, air exchange, moisture exchange and skin heat exchange. Fig. 4. 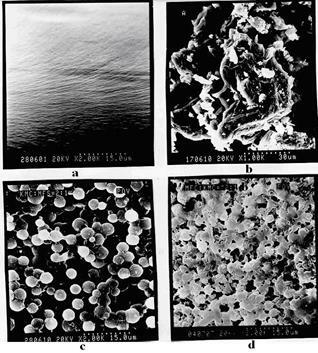 Elektronno-microscopic pictures of surface Na-CMC (a), UFО (b) and polycomplex bases at mole parity Na-CMC: UFO = 2:1 (c), 1:2 (d). 1. Kabanov V.A., Zezin A.B. and others. Polyelectrolytes in solving environmental problems // Success chemistry. -Moscow 1991 P.60.- №2.- p. 595-606. 2. Kaljuzhnaja R.I., Rudman A.R. and others. The conditions of formation and properties of membranes of polyelectrolyte complexes based on weak polyelectrolyte. // Polymer. connection. - Moscow 1975 T.A17.- p. 2786-2792. 3. Zezin A.B., Eltsefon B.S. and others. Interpolymer complex - biocompatible polymer materials and the problem thrombotic resistance. // Chemical and pharmaceutical. journal. -Moscow, 1987. -№7. p. 788-802. 4. Zheleznova I.V., Rudman A.B. and others. Effect of different factors on the state of water and properties of hydrogels polyelectrolyte complexes for medical purposes. // Chemical-Pharmaceutical journal. -Moscow, 1988. -№2. - p. 227-231. 5. Kemenova V.A., Mustafin R.I., Alekseev K.B., Skorodinskaya A.M., Zezin A.B., Tentsova A.I., Kabanov V.A. // Use of interpolymer complexes in pharmacy. "Pharmacy", 1990, №3, p.80 - 88. 6. Nazarova Z.A. Creating emulsion and hydrophilic bases using local raw materials and improved technology ointments with them // Dr. Pharm. Sciences. - Tashkent, 1996.- p. 228. 8. Bradley D.E. Electron Microscopy Technique. - Moscow, "World", -1965.- p.5. 9. Rudman A.R., Kaljuzhnaja R.I. and others. The structure and properties of the polyelectrolyte complexes of polyacrylic acid and polymeric heterocyclic amine. // Head of the.Conn. -Moscow, 1983. T.A 25.- №11.- S.2405-2412. 10. Baranowski VY, Kazarin, LA dr.Kompleks and polyacrylic acid, polyacrylamide. // Head of the. Conn. -Moscow 1984 Ser.A. P.24.- №6.- p.1480-1483. 11. Nieuwenhuis J., Tan Y.Y., Alberda Van Ekenstein G.O.R., Pervaporation of water-n-propanol Mixtures Through Membranes Composed of poli- (N-vinylpirrolidone) - Poly (Methacrylic acid) complexes. Angrew. Macromol. Chem.- 1987.- 147. - p.83-87. 12. Khasankhanova M., Inagamov S.Ya., Ozerin A., Muhamedov G.I., Iskandarov S.I. X-ray diffractometric study carboxymethylcellulose interpolymer complexes with amine urea-formaldehyde resins. // Reports of UzSSR. -1992.-№7.-p.52-53. 13. Muhamedov G.I., Inagamov S.Ya., Khasankhanova M.N. Physical and mechanical properties of polymer complex composite materials based on sodium carboxymethyl cellulose with urea-formaldehyde resin. // Plastic massy. 1988, -№12.-p.18-19. 14. White M.L., The permabilitiof an acrylamide polimer Gel. // J., Phys. Chem. 1960.- V.64.- p. 1563-1565.